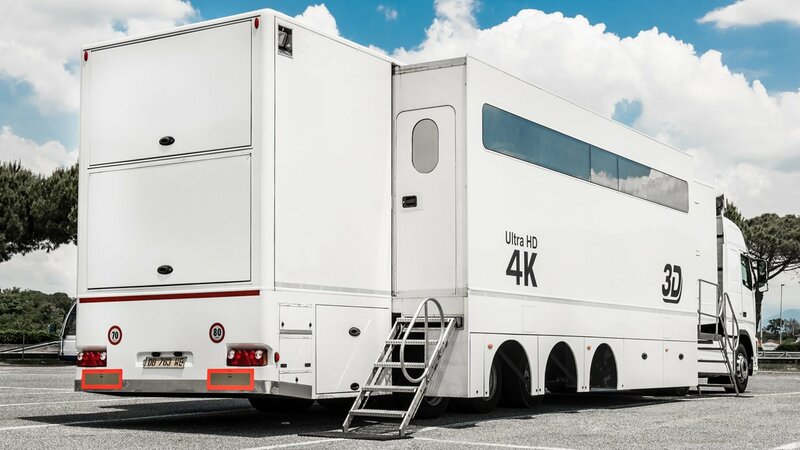 This 24-camera double-expanding OB trailer is offered fully wired for 4K broadcasting. The vehicle offers the option of a second production room. The vehicle includes an 80-input/48-output Sony MVS-7000X vision mixer capable of HD broadcasts, or we can provide costs for installing a 4K vision mixer. Sony LMD-series monitors are included throughout. The audio gallery includes a 140-input Studer Vista 5 audio mixer and Genelec 5.1 surround sound monitoring, as well as a Riedel Artist M128 intercom router. Routing, distribution and multiviewers are provided by Harris, with Tektronix testing and measurement. Built in 2006, this air-conditioned, 125A 3-phase 380V vehicle is sold as trailer-only. Branding logos (removed from images for client confidentiality) on the exterior will require removing.